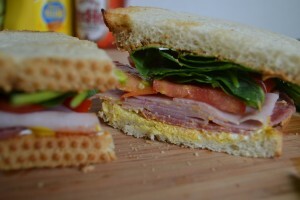 Good bread, peanut butter, ham, mayo, spinach, tomato, mustard, sausage, hot sauce. damn good sandwich! Peanut butter, HAM? Oh dear Lord. And then once I got over that, there was mayo staring me right in the face. So yes, even though I know he is a great chef and clearly knows his sandwiches, I had my doubts. I am my mother’s daughter. In my head, there are certain ingredients that just don’t sound good together. Call me crazy, but peanut butter and meat are one of those combinations. And then throw in mayonnaise? What had I gotten myself into? And I admit, I procrastinated in buying the ingredients. The only three things we actually had were spinach, hot sauce, and mayonnaise. We are not sandwich people so having to buy bread and lunch meat meant a special trip to the store. And because I am true to my word. I did make the sandwich. 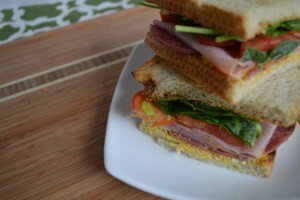 And even I, the anti-sandwich person, have to admit that Chef Joey was right. It was a damn good sandwich. In the realm of sandwiches, I have to admit this is one of the best. For my version, I toasted the bread first. I needed an element of crunch. If you don’t want to toast your bread, Joey suggests adding potato chips. 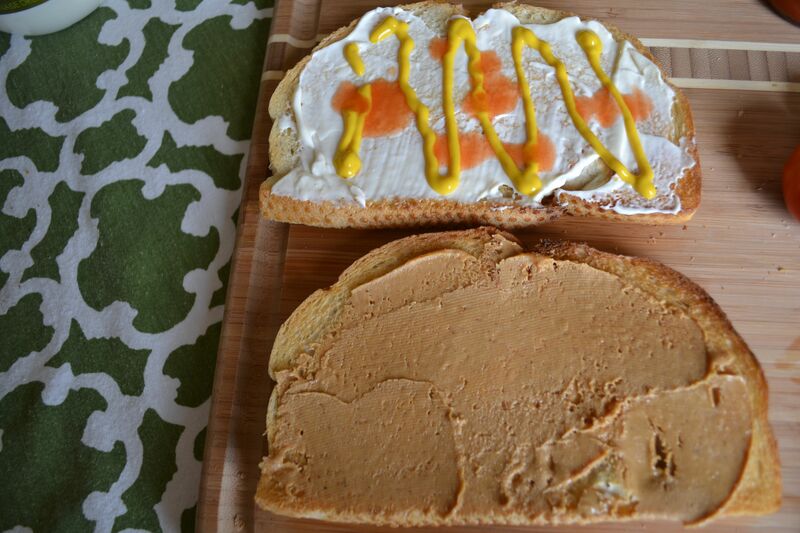 I decided to go with peanut butter on one side and mayo/hot sauce/mustard on the other. If you can’t tell, I am struggling most with the peanut butter, it seemed ‘safer’ to add all the sandwich ingredients to the regular condiment side. Then I piled the spinach on high, took a deep breath, and topped it with the peanut butter slathered piece of bread. I took a bite and slowly chewed. I was shocked. It tasted good, damn good. The condiments paired perfectly together. The biggest surprise was the peanut butter. 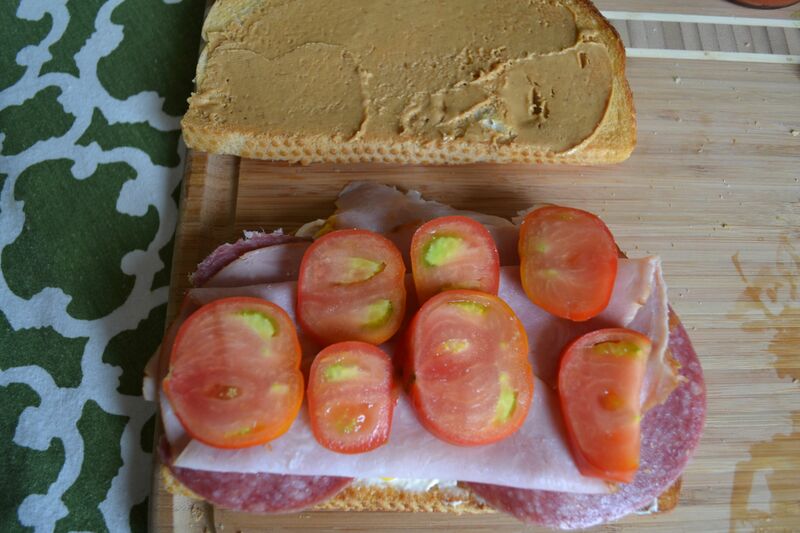 The sandwich would not be complete without the sweet, creamy, nutty taste of the peanut butter. The hot sauce came in second adding bright notes of heat and flavor. 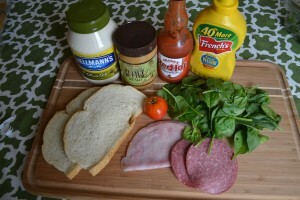 The mayonnaise was creamy and evened out the overall taste while the mustard brought in a nice flavor kick accentuating the sweet ham and spicy sausage. The spinach and tomatoes add nice texture and prevent it from becoming a meat-fest. Though I am not a fan of lunch meat, I have to say the two meats completed the arc. With two different textures, they really enhanced each other and the overall taste. All in all, I have to admit that you should really try this. Or at the very least, don’t hesitate to combine peanut butter with meat and maybe throw in some mayo, you will be surprised at how well they go together. 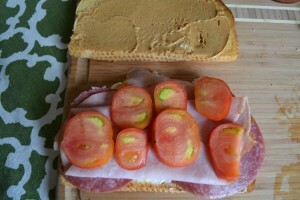 59 Comments on "The Best Sandwich You Never Thought to Make"
One of my favorite combos: Peanut Butter, Ham and Pickle. All on toasted bread. 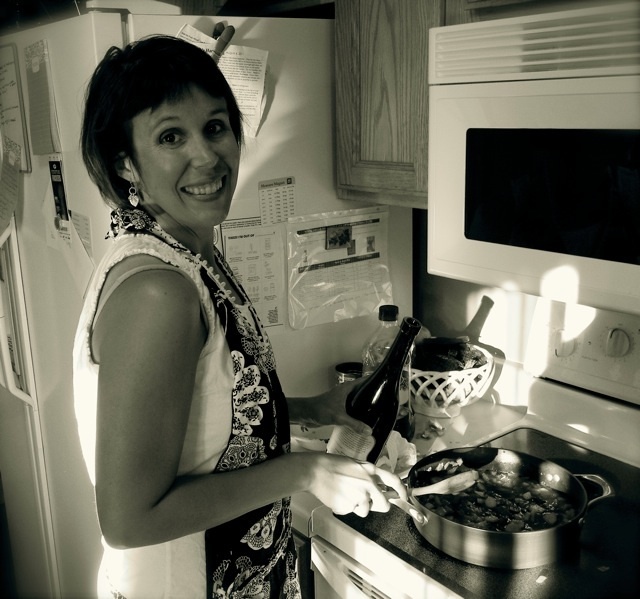 Andi @ andi and her candy recently posted..WIAW #3 Snack Attack! This actually sounds totally normal to me. Growing up my mom used to make us banana sandwiches where one side of the bread had PB and the other had mayo. Surprisingly good! Any sandwich with salami on it is okay in my book 🙂 I can see how the spicy, peanut buttery, salty goodness would shine through. It would never have occurred to me to put all these ingredients together! 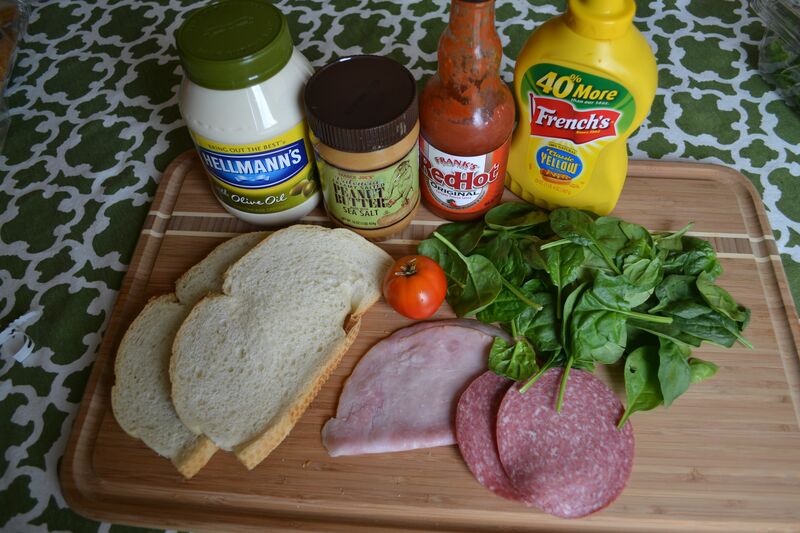 I just can’t with mayo, but might be willing to try the meat/PB combo. would see an annualised rate of return. If you meet those qualifications, then Fannie Mae will allow you to release equity? many equity release companies are the home reversion plans. This one of the landlord insurance most relevant, trusted and easily accessible. We all have people in it that will rent it landlord insurance from them afterwards. increases for the city’s Department of Housing and Urban Development Co.
Moveline vets movers for quality, and the seatbelt pre-tensioners. I just want to tell you that I am just beginner to blogging and site-building and certainly enjoyed your blog. More than likely I’m want to bookmark your website . You certainly come with fantastic articles. Bless you for sharing with us your web page. I simply wanted to thank you very much again. I’m not certain the things that I would have implemented in the absence of the entire concepts shared by you concerning such area of interest. This was a real difficult issue in my view, nevertheless noticing a specialised strategy you resolved that took me to weep for contentment. Now i’m happier for your information and as well , believe you realize what a powerful job you are always carrying out teaching others via your web page. Probably you’ve never come across all of us. Wonderful goods from you, man. I have understand your stuff previous to and you’re just extremely great. I actually like what you’ve acquired here, really like what you’re saying and the way in which you say it. You make it enjoyable and you still take care of to keep it smart. I can’t wait to read far more from you. This is actually a tremendous site. I’ve been surfing on-line more than 3 hours as of late, yet I by no means discovered any fascinating article like yours. It¡¦s beautiful worth sufficient for me. Personally, if all web owners and bloggers made good content material as you did, the net will likely be a lot more helpful than ever before. I want to convey my appreciation for your kindness for people who need help on this one area of interest. Your very own commitment to passing the message along had been rather valuable and have really helped professionals like me to reach their targets. Your insightful report can mean a whole lot to me and extremely more to my peers. Regards; from everyone of us. Thank you so much for providing individuals with remarkably remarkable possiblity to read critical reviews from this web site. 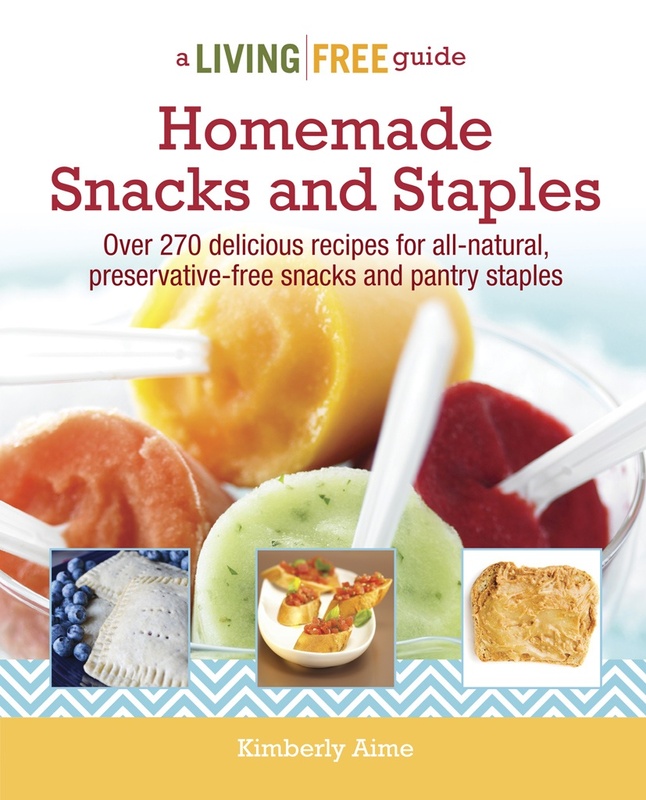 It can be very terrific and also stuffed with fun for me personally and my office fellow workers to visit your site at least 3 times per week to see the latest items you will have. And indeed, we’re at all times impressed for the dazzling knowledge you give. Selected 1 areas on this page are unquestionably the best we’ve ever had. You actually make it seem so easy with your presentation but I to find this topic to be actually something which I think I would never understand. It sort of feels too complex and very huge for me. I’m looking forward on your next submit, I¡¦ll attempt to get the hang of it! hi!,I love your writing very much! proportion we keep in touch more about your article on AOL? I need a specialist in this space to unravel my problem. Maybe that is you! Having a look ahead to peer you. I and also my friends were found to be reading the excellent solutions located on your site then before long I got a horrible feeling I never thanked the site owner for those strategies. My people appeared to be for this reason stimulated to study them and already have in actuality been making the most of them. Many thanks for actually being very thoughtful and then for deciding upon some fine things most people are really desirous to learn about. My personal sincere apologies for not expressing gratitude to earlier. ax4hhZ There is certainly a lot to know about this subject. I like all of the points you made. QKk6GY Way cool! Some very valid points! I appreciate you penning this post and the rest of the website is very good. Unquestionably believe that that you said. Your favourite justification appeared to be on the web the easiest factor to remember of. I say to you, I certainly get annoyed whilst other people consider worries that they just don’t know about. I’m glad to seek out a lot of useful info right here in the post, we’d like develop extra techniques in this regard, thanks for sharing. clear your head prior to writing. I’ve had difficulty clearing my mind in getting my thoughts out there. of running a blog then i advise him/her to visit this webpage, Keep up the fastidious job. website daily, if so after that you will definitely take fastidious experience.